Henry Mayhew’s non-fictional accounts of life in Victorian London bring an investigative eye to aspects of the metropolis better known through the fictional caricatures of Dickens. Absent are the comic grotesques, the sentimental interplay between rich and poor, the class satire, the poking fun at institutions, the cradle-to-grave pathos of the serialized novel. Here in their place are compassionate and well-evidenced descriptions of the kindness, resourcefulness and dignity of the urban underclass. Alongside them in this collection are meticulous accounts of balloon rides, maritime trade and railway journeys that summon the spirit of the age with enchanting detail. What they all have in common is a keen sense of social purpose, and the humility of a man who had himself experienced the ups and downs of the Victorian Age, had himself lost his wealth, and had himself been complicit in the mania of travel, enterprise and productivity in whose wake the eponymous piemen and the orphaned flower girls of London subsisted. 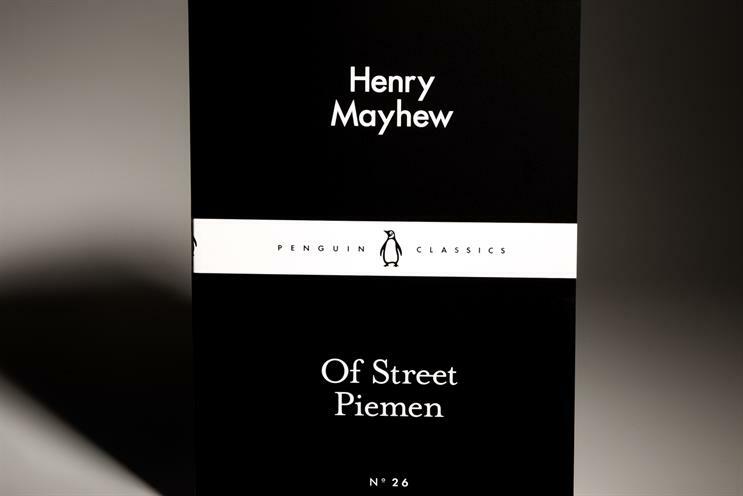 There are lots of reasons for marketers to read Of Street Piemen. Marketing is governed by human economics, and marketers should read Mayhew for his forensic portraits of thrift and enterprise. Marketing serves demography, and marketers should read Mayhew for his sharp-eyed chronicles of life in what was then the world’s principal metropolis. Marketing makes new ideas familiar, and vice versa, and marketers – particularly those who are veterans of the commute through post-industrial Battersea – should read Mayhew’s account of a train journey to Clapham Common. But above all, marketing is about selling, and marketers should read Mayhew for his account of the street traders in the night market of New-Cut in Waterloo. "Until it is seen and heard, we have no sense of the scramble that is going on throughout London for a living." The cacophony of the night market, where products are sold on the basis of price and where sellers lure buyers with vocal flair, use of language and force of personality, commands nostalgia and respect because it is authentic and industrious, but commodity trading – however charismatic - is not a useful reference for modern marketing, because the human elements that technology has replaced are the only elements we ever admired. As the business of selling walnuts or chestnuts or wet fish or blackberries or turnips or parsley moved from the streets to shops and from shops to supermarkets, it wasn’t just that consumption and production were separated by a distance that only a marque of origin could close, it was that buyer and seller were separated by a veil of corporate motive that marketing sought to make as transparent or as attractive as possible. Now, in the 21st century, with buyers and sellers connected online in ways that Mayhew could never have imagined, marketing is often asked to step aside and let the raw trading resume. The role of brand in the new global marketplace has to be reexamined, it is true, and neither the New-Cut paradigm nor the Tesco model is likely to hold. What remains unchanged, however, is the buyer’s need to trust the seller, and the seller’s need to attract the buyer’s attention, and marketing is likely to continue to play its part on both fronts. Or, as one of Mayhew’s street-sellers puts it, "Now’s your time! Beautiful whelks, a penny a lot."